I'm not sure how wrong it is to be obsessed with food. Is it any better than being an addicted to drugs, or alcohol, or hoarding? The answer is Yes, probably. BUT, I feel like I really could eat forever. There's no actual time where I could refuse an offer of food, unless it is a) after a hotel breakfast buffet, or b) if that food is the national dish of Iceland, Hakarl (once was enough). When I am not at a luxurious breakfast buffet which is 99.8% of the time, I find I have an unlimited appetite mostly because I like to snack. I enjoy eating small portions many times a day, not because some celebrity nutritionist says it's healthier or whatever, but because it is fun for me and I like variety. People say they have a "sweet tooth", but my teeth care for nothing. I have a sweet tongue and tummy - I love the taste of a touch of sweetness in my snacking and it really makes my stomach happy. If there are no cookies or bars in the house, I am just not myself. 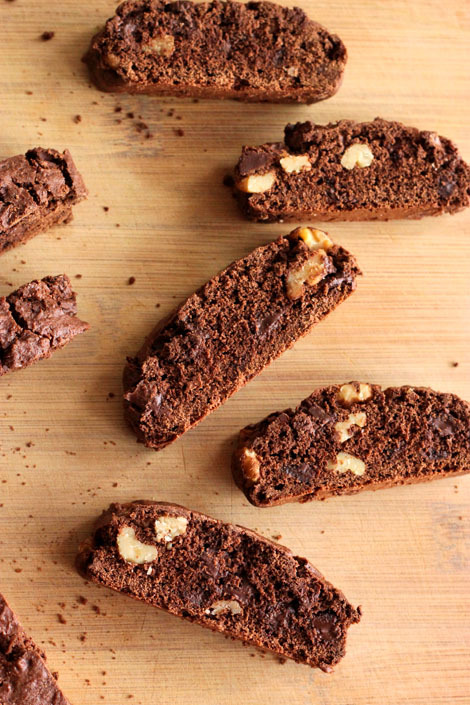 To continue my chocolate + walnut theme from last week, I made Double Chocolate Walnut Biscotti today. 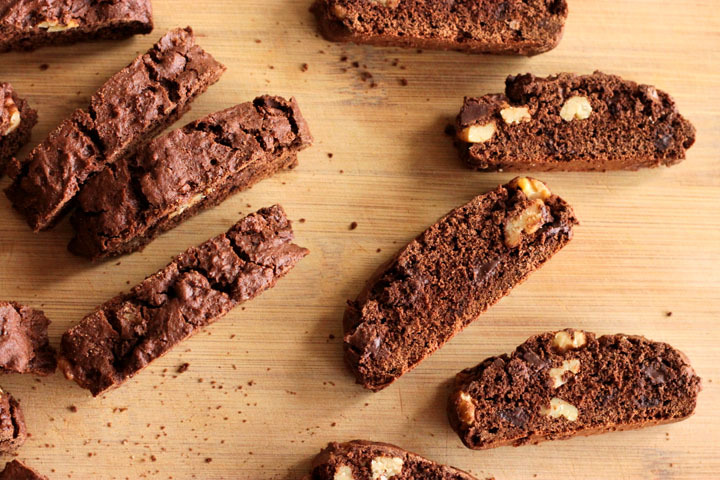 For some reason biscotti never generate the same excitement as other cookies, but I think they're great. For me a satisfying snack hasn't reached its potential unless it contains chocolate - deep dark chocolate. So the chunks in this recipe are not optional. They need to be there. 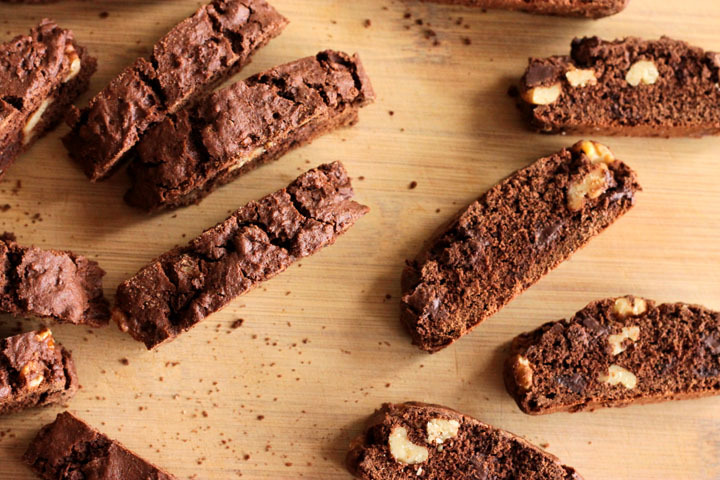 Aside from the time it takes to bake them twice, biscotti are truly easy to put together. There's no creaming necessary and no machine required. You don't need to worry about your butter being soft enough because it just needs to be melted - it can come straight from the fridge. All you need is a bowl and a whisk and the will to crunch. Preheat your oven to 350°F/180°C and line a baking tray with parchment paper. Whisk together eggs and sugar in a large bowl until they are thickened and lightened by a shade. This will take a minute or two by hand. Stir in melted butter. Sift in flour, cocoa, baking powder, baking soda and salt and stir together until a dark dough forms. 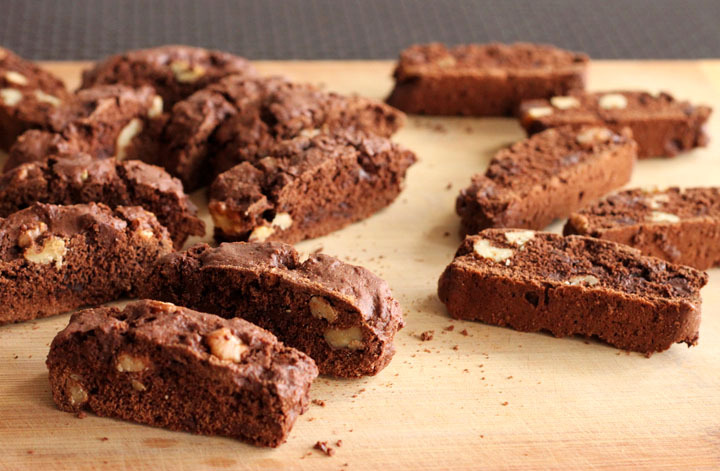 Fold in the chocolate and walnuts until distributed throughout the dough. Divide the dough into two equal portions and shape into logs about 9 inches long. Flatten the logs and bake for 25-30 minutes or until they are firm, matte and slightly cracked on the surface. Reduce the oven temperature to 325°F/165°C. Remove from the oven and let cool for about 15 minutes before slicing into ½ inch pieces. Lay the cookies flat on the same lined baking tray and bake them again for 10 minutes, before flipping them over for a final 5-10 minute bake. They're ready when they feel dry throughout. Transfer the cookies to a wire rack to cool completely before storing in an air-tight container.